I am a midwife and therefore have supported many women to give birth over the years. Naturally I felt that when it came to my own birthing I would be fantastic at it and didn’t foresee any issues. 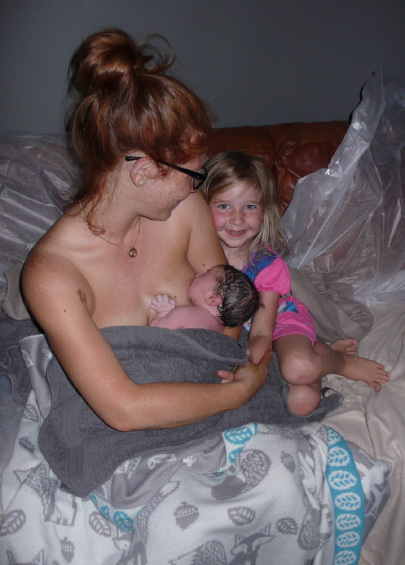 So during my first pregnancy I planned a home water birth. This all changed when I developed pre-eclampsia, a potentially life threatening condition of pregnancy that can only be cured by delivery of the baby. So I consented to an induction of labour in hospital at 40+5 which resulted in a cascade of intervention over a 30 hour labour ultimately resulting in an emergency caesarean section. My recovery from this took a very long time. I was traumatised and so was my husband Adam. We both felt cheated of a birth experience and I questioned everything I’d ever believed about birth and feared my trust in women’s ability to birth was destroyed. 2 years later my husband and I knew we wanted to expand our family. I conceived easily and started looking into ways to prevent a repeat of our previous experience. I had looked into Hypnobirthing and felt it could be right for me and my husband as it is based on sound scientific evidence and gives you control over your birth which is what I felt we lacked the first time. The 1:1 KGHypnobirthing course we took was everything I needed and more! It helped me to begin to trust in my body and the process of birth and it was amazing to feel trust in myself again. It also helped me to forge stronger relationships with my Midwives and Obstetricians which is a big part of the Hypnobirthing course. This obviously increased my ability to relax as I had every faith that my caregivers and I were working in partnership towards the best outcomes for me and my baby. All went to plan and we achieved a home water hypnobirth with a labour that lasted under 4 hours with no complications (see Adam’s Story). For our third birth we completed another 1:1 Hypnobirthing course. By this point Adam and I fully understood how crucial it is to invest in preparing for birth in the same way you would train for a marathon. The sessions, combined with the practice my husband and I did each evening were the best bits of my pregnancy by far. Learning to train your body and mind to relax beyond anything you have previously experienced is magical and brings you closer as a couple. In the end this time around I feel that the hypnobirth practice we did actually benefitted Adam the most! 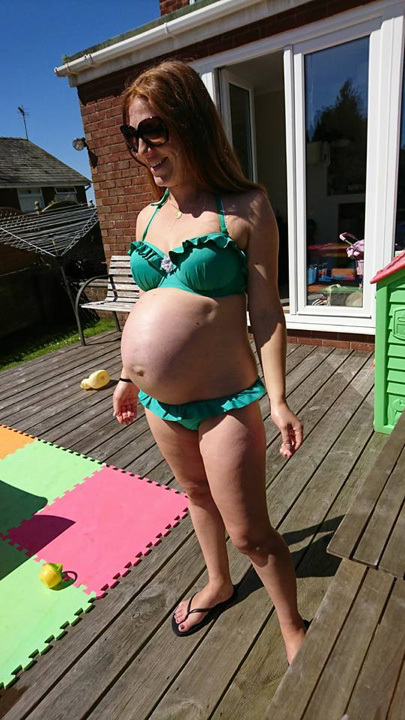 It was a blazing hot Sunday in June and I was 40+5 days pregnant with our 3rd baby. I had never been pregnant this long before but felt calm and confident that our baby would healthily choose their own Birthday. I spent the day in the garden with my husband Adam and our two daughters Ayda age 4 and Elke 19months playing in the paddling pool and enjoying the beautiful weather. I remember standing on the deck in my bikini as Adam took this photo wondering how this baby would change our family when they arrived, and feeling so happy and loved. That night, once the girls were in bed, as I laid on the sofa watching TV with Adam the baby began to move so strongly that Adam got out his phone to film it! I wondered if the baby was trying to find a better position as I felt they had been in a posterior position lately (‘back to back’) and the movements were so strong it took my breath away! After around 20 minutes the baby calmed down and Adam and I went up to bed. I joked as we climbed under the sheets together that I felt like we would wake up in the morning and the baby would just be born then and there after the effort they had made to get out tonight! I presume the baby was listening when I said this….. I awoke at 02.04am to an odd sensation in my cervix. Anyone who has had a coil fitted will understand the feeling I had – it’s a yucky achy sensation that is unpleasant but not painful. I suspected the baby was pressing down on my cervix and my bladder might be full making the feeling more intense so I got up and went to the bathroom. I had a wee and the sensation went away so off I went back to bed feeling happy I had found a solution! Once back in bed I settled down to go back to sleep but again became aware of the sensation in my cervix. It was uncomfortable but eased after a minute or so but kept returning. By 02.30am I was breathing deeply through the intense sensations so suddenly wondered if this could be labour, even though I didn’t feel any tightening. I woke Adam at this point and explained what was happening. Once on my feet the sensations intensified again and I told Adam we needed to go downstairs and fill the pool. Adam was very chilled about all this and kept stopping to be with me when I was deeply breathing through the waves that were coming thick and fast. I however was starting to feel a real sense of urgency that he get the pool filled that he didn’t appear to share! By this point we were downstairs in the living room which had been set up with the Birth Pool inflated, vases of white roses and my Affirmations hanging from pretty brown string with butterfly clips along the wall for a couple weeks now. Adam busied himself calmly covering the sofa with the plastic sheeting and blankets we had prepared and put the video camera on the shelf on the wall facing the birth pool as I really wanted a video of this birth. Unbeknown to me he was having a few problems with the tap connector so the pool was not filling yet. I called the hospital whilst Adam was making these preparations to request the Community Midwives on call to attend me. The on-call midwife called me back and said she was on her way and would be about 20 minutes. I said I was starting to feel some pressure so she said she would hurry – in actual fact my body had already entered the down phase of labour at this point and was bearing down strongly during the sensations. As soon as I got off the phone at about 02.40am I felt I needed to remove my pajama bottoms which I did whilst Adam reminded me to relax and breathe (he was frantically trying to fix the tap connector now that had blown off the tap whilst appearing completely relaxed and calm when in the living room with me! I had no idea of the issues he was having!). I knelt down on the floor leaning over the sofa as the sensations were now so intense I didn’t want to stand up anymore. I was now becoming more vocal as it was so intense and I could feel the baby moving down now. I asked Adam to call an Ambulance as I knew the Midwife would not make it and that sometimes babies born very quickly can be a bit shocked and need help to breathe (I have no idea how I still had my Midwife head on at this point?! ).I also told him to call his parents who live close by to come to help with the children. I told Adam the baby was coming and he told me to relax and breathe and I told him the baby was coming now! He asked me if I was sure! Adam was on the phone to Ambulance control who were asking him lots of questions. Our 4 year old daughter Ayda was woken by the noises I was making – roaring, grunting noises that were involuntary but my way of coping with how intense and super fast this labour was. I had no time to use any of the tools we had planned to use – music, lighting, essential oils, the pool. Ayda was on the stairs outside the room and Adam told her to go back to bed – but she was a bit upset and worried about me due to the noises I was making. So between surges I reassured Ayda that Mummy was just fine and she joined us in the living room. My waters released as our baby’s head came down and was born, her body following quickly on a wave of amniotic fluid at 02.50am! Adam caught her in a pile of all the towels we had prepared downstairs then I reached around and picked up our baby who was covered in meconium! We looked and saw she was a girl. Ayda was shrieking with delight! I eased myself onto the sofa with our baby girl in skin to skin, her cord still intact between my legs as we planned optimal cord clamping (where the cord is left intact until all up to a 3rd of the baby’s blood returns to it from the placenta), despite the Ambulance controller telling Adam to clamp the cord immediately! Ayda fetched another towel (a tiny hand towel!) from the bathroom for us and we wrapped me and the baby in it to keep us warm as Ayda crawled onto the sofa next to us. The Midwife arrived about 10 minutes after baby Cicely was born! I was a bit shocked at how quickly it had all happened and was shivering a bit so she made me have a sugary drink to help with this. She also went to cut the cord but Adam thankfully stepped in and said no to this – one of the many ways he was an amazing birth partner who knew all our preferences and was the protector of our environment even in unplanned circumstances. We both attribute Hypnobirthing as the reason he remained so calm and in control throughout Cicely’s precipitous birth. Adam really used all the techniques we had learned through Hypnobirthing. I truly believe I couldn’t give birth with the same knowledge, confidence and relaxation without Hypnobirthing and recommend every woman and her birth partner try it. The techniques will support us as parents and throughout our lives in so many different ways. I’m so thankful we invested in our births for the fantastic outcomes we have enjoyed since- not to mention the ‘Hypnobaby’ effect that has seen both my hypnobabies sleeping through with such relaxed personalities!